This article is about a Unified Combatant Command of the U.S. Armed Forces. For the Chinese tower manufacturing and wireless broadband company, see Northcom Group. United States Northern Command (USNORTHCOM) is a Unified Combatant Command of the U.S. military tasked with providing military support for non-military authorities in the U.S., and protecting the territory and national interests of the United States within the continental United States, Puerto Rico, Canada, Mexico, The Bahamas, and the air, land and sea approaches to these areas. It is the U.S. military command which, if applicable, would be the primary defender against an invasion of the United States. USNORTHCOM was created on 25 April 2002 when President George W. Bush approved a new Unified Command Plan, following the September 11 attacks. USNORTHCOM went operational on 1 October 2002. The support that USNORTHCOM provides to non-military authorities in the U.S. is legally limited by the 1878 Posse Comitatus Act, which restricts the role of the U.S. military in domestic law enforcement. However, in case of national emergency, natural or man-made, its Air Forces Northern National Security Emergency Preparedness Directorate will take charge of the situation or event. USNORTHCOM was established on 25 April 2002 when President George W. Bush approved a new Unified Command Plan, and attained initial operating capability on 1 October 2002. USNORTHCOM’s Area of Responsibility (AOR) includes air, land and sea approaches and encompasses the continental United States, Canada, Mexico and the surrounding water out to approximately 500 nautical miles (930 km). It also includes the Gulf of Mexico, the Straits of Florida, portions of the Caribbean region to include The Bahamas, Puerto Rico, the U.S. Virgin Islands, the British Virgin Islands, Bermuda, and the Turks and Caicos Islands. The commander of USNORTHCOM is responsible for theater security cooperation with Canada, Mexico, and The Bahamas. In May 2011, NORTHCOM was mobilized in the wake of the BP oil spill in the Gulf of Mexico to provide air, ground, and logistical support. 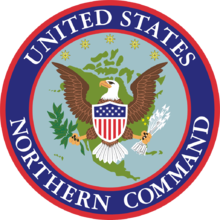 In October 2014, NORTHCOM took administrative control of Alaskan Command. Commander, U.S. Northern Command is concurrently Commander of the U.S.-Canadian North American Aerospace Defense Command (NORAD). The two are co-located at Peterson Air Force Base in Colorado Springs, Colorado. General Ralph Eberhart was the first CDRUSNORTHCOM. USNORTHCOM headquarters has approximately 1,200 uniformed and civilian members, and few permanent forces. Forces from all branches of the U.S. military may be assigned to the Command as needed to complete its mission. USNORTHCOM exercises command and control of two subordinate unified commands, four service component commands, and several standing Joint Task Forces (JTFs). 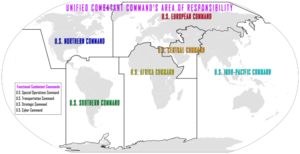 The subordinate unified commands are Special Operations Command-North, which was activated on 31 December 2012, and Alaskan Command, which was transferred from US Pacific Command (USPACOM) control to USNORTHCOM control on 1 October 2014. USNORTHCOM service components include U.S. Fifth Army/ARNORTH, First Air Force/AFNORTH, USFF/NAVNORTH, and U.S. Marine Corps Forces Reserve/MARFORNORTH. USNORTHCOM's Joint Task Forces include Joint Force Headquarters National Capital Region, Joint Task Force-Civil Support, and Joint Task Force North. Between 1 October 2002 and 2007, Northern Command deactivated Joint Force Headquarters Homeland Security and activated Joint Force Headquarters National Capital Region and Standing Joint Task Force North. On 31 December 2012, Special Operations Command-North was activated, and will be led by a general instead of a colonel. Note: The National Defense Authorization Act of 2008 stipulates that at least one deputy commander of USNORTHCOM be a National Guard general officer unless the commander is already such an officer. Northern Command has created several classified "concept plans" (e.g. "Defense Support of Civil Authorities") that are intended to address the 15 National Planning Scenarios that NORTHCOM must be prepared to respond to. However the GAO found that the national strategy to defend the United States is several years out of date. NORTHCOM operates extensive domestic intelligence operations which both share and receive information from local, state and federal law enforcement agencies. Employees of the Federal Bureau of Investigation, Central Intelligence Agency, National Security Agency, Defense Intelligence Agency, National Geospatial-Intelligence Agency, and other agencies maintain offices at NORTHCOM and receive daily intelligence briefings. Northern Command has completed several joint training exercises with local, state and federal law enforcement agencies, the Department of Homeland Security, and the Federal Emergency Management Agency (FEMA). In Exercise Vigilant Shield 2008, Northern Command, Pacific Command, the Department of Homeland Security, and numerous law enforcement agencies across the U.S. conducted exercises to test their "response abilities against a variety of potential threats". The Military Commissions Act of 2006 lifted many restrictions placed on the military to support non-military authorities by the Posse Comitatus Act, however the United States Supreme Court ruled in June 2008 that significant portions of the MCA were unconstitutional. The "John Warner Defense Authorization Act of 2007" H.R. 5122 (2006) effectively nullified the limits of the Insurrection Act when it was passed; however, the bill was amended in 2008. On 1 October 2008, the 3rd Infantry Division’s 1st Brigade Combat Team was assigned to U.S. Northern Command, marking the first time an active unit had been given a dedicated assignment to Northern Command. The force will be known for the first year as a CBRNE Consequence Management Response Force, and will serve as an on-call federal response force for terrorist attacks and other natural or manmade emergencies and disasters. ^ Whitley, Joe D.; et al., eds. (2009). "Unified Combatant Commands and USNORTHCOM". Homeland security: legal and policy issues. American Bar Association. ISBN 978-1-60442-462-1. ^ Bolkcom, Christopher; et al. (2005). "Homeland Security: Establishment and Implementation of Northern Command". In Thaler, William M.; Bea, Keith. Emerging issues in homeland security. Nova Publishers. p. 107. ISBN 978-1-59454-139-1. ^ Cecchine, Gary, ed. (2004). Triage for civil support: using military medical assets to respond to terrorist attacks. RAND Corporation. p. 25. ISBN 978-0-8330-3661-2. ^ National Research Council (U.S.). Committee on Army Science and Technology for Homeland Defense--C4ISR (2004). Army science and technology for homeland security. National Academies Press. p. 73[verification needed]. ISBN 978-0-309-09164-0. ^ Jacoby, Charles. "2014 NC Posture Statement" (PDF). northcom.mil. Retrieved 18 April 2015. ^ U.S. Northern Command Public Affairs (22 October 2009). "About USNORTHCOM". USNORTHCOM website. Peterson Air Force Base, CO: U.S. Northern Command. Archived from the original on 16 August 2009. Retrieved 28 July 2010. ^ "USNORTHCOM responds to Deepwater Horizon oil spill". Northcom.mil. Retrieved 19 May 2011. ^ "Deepwater Horizon airspace activity now coordinated at 601st AOC". Northcom.mil. 13 July 2010. Retrieved 19 May 2011. ^ "NORTHCOM assumes oversight of Alaskan Command - Stripes". ^ Cutler, Thomas (2011). Navcivguide. Naval Institute Press. p. 59. ISBN 978-1-61251-019-4. ^ "U.S. Northern Command History". Retrieved 11 February 2013. ^ "U.S. Northern Command". Archived from the original on 16 August 2009. Retrieved 11 February 2013. ^ United States Northern Command, Advance Questions for Lieutenant General Victor E. Renuart, USAF, Nominee for Commander, U.S. Northern Command (USNORTHCOM) and Commander, NORAD, pre-confirmation hearing on Monday, 19 March 2007. See also https://www.senate.gov/legislative/LIS/executive_calendar/2007/03_19_2007.pdf. ^ Kimberly Dozier (17 January 2013). "U.S. boosts spec ops to train Mexican forces". Army Times. Associated Press. Retrieved 19 January 2013. ^ Wormuth, Christine E. & Witkowsky, Anne (2008). Managing the next domestic catastrophe: ready (or not)? : a beyond Goldwater-Nichols phase 4 report. CSIS. p. 47. ISBN 978-0-89206-534-9. ^ "DOD Needs to Address Gaps in Homeland Defense and Civil Support Guidance GAO-13-128, Oct 24, 2012." ^ Miller, Russell A. (2008). US national security, intelligence and democracy: from the Church Committee to the War on Terror. Taylor & Francis. p. 172. ISBN 978-0-415-44646-4. ^ a b Head, Michael & Mann, Scott (2009). Domestic deployment of the armed forces: military powers, law and human rights. Ashgate Publishing. p. 60. ISBN 978-0-7546-7346-0. ^ "Bush Moves Towards Martial Law, 26 October 2006". Towardfreedom.com. 26 October 2006. Retrieved 19 May 2011. ^ "Brigade homeland tours start Oct. 1". Army Times. 30 September 2008. Retrieved 19 May 2011. Colonel Cronen; R. Barry (December 2009). "U.S. Northern Command & Defense Support of Civil Authorities". Center for Army Lessons Learned (CALL) Newsletter. 9 (10).